on what it takes to grow your business in today’s global marketplace. In the Digital Age, even small brands can build a worldwide customer base. to a multi-regional, multilingual and multi-cultural audience. Click on any episode title below for the audio link and show notes. Subscribe via iTunes or Google Play. Subscribe via iTunes or Google Play and leave a rating or review! Follow The Worldly Marketer updates on Twitter and Facebook. Be the first to find out about new episodes: join the mailing list! 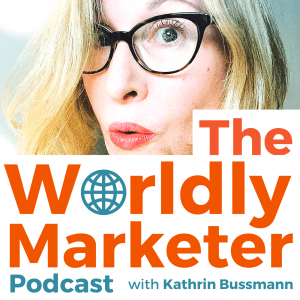 Would your organization be a good fit to sponsor The Worldly Marketer Podcast? Contact Kathrin to discuss sponsorship opportunities.